What is a Midgard Mastiff? A Midgard Mastiff is a line of hybrid working mastiffs that has blood from both bull and mastiff breeds, and has been bred for athleticism, performance, and working ability. There are organizations that paper Midgards, but unless you compete in dog shows, there really is no point to dog papers. These aren’t show dogs they’re working dogs. A working dog is a dog bred to do a job other than hunting. This includes pulling, guarding, herding, search and rescue, and any other job that we need from them. Like the original Mastiffs Midgards are bred for protection and hunting dangerous game like wild boar. Is working a dog abuse? A well bred working dog will love his job, working will be a part of his nature. Working breeds really need to work to feel fulfilled. Denying a working dog the chance to work causes frustration, and can cause behavioral problems (chewing, etc). I’d consider not working a working dog abuse before I’d consider it abuse to let him do the work he was born for. How do I know if a Midgard is right for me? If you are a capable dog owner, have adequate facilities, follow up on your responsibilities and have anything or anyone worth protecting, a Midgard is right for you. I breed for, tall, muscular, healthy, clean, protective, family oriented, driven, agile, tough, intelligent, and beautiful. Things I don’t like in a dog are dog aggression, instability, unsoundness, roaminess, rankiness. To me a guard dog should be large and frightening enough to deter most threats, and powerful and driven enough to handle the rest. He should always want to be by your side, that’s a guard dog’s place. With proper socialization, he should be accepting of any dog or person he meets who is acting normally, and should naturally show aggression to any person showing aggression, fearfulness, or any other suspicious behavior. In general, bulldogs have lots of prey drive, but low defense drives, mastiffs have lots of defense drive, but low prey drive. The goal is to create a dog with both high prey and defense drive, this makes for a very forward, aggressive, protector. Also, bulldogs have a higher strength to weight ratio than mastiffs and mastiffs have much higher weight, put together well and you get and incredibly large, powerful, and agile dog. Those two groups are descended from a common ancestor, and between the two populations the genes that made the original Mastiffs great still exist. They are just mixed in with a lot of garbage traits, and needed to be brought back together and the garbage filtered out to recreate the mastiff as it was before they were bred for fashion. Like many breeds Midgards are bandogs. Bandog or bandogge is not a breed it is a job description like saying hunting dog, sled dog, or guard dog. Any dog who does that job is a bandog, whatever the breed. Just like a Greyhound can be a hunting dog or a Beagle can be a hunting dog, a Midgard can be a bandog or a Presa can be a bandog. Why are they called bandogs? Is it expensive to keep a mastiff? There was a study done by a British insurance company that offers pet insurance link. They found the most expensive breed by far is the Chihuahua. Costing 7,000 euro more than a mastiff over it’s lifetime and 55,000 euro more than a bulldog. Plus these numbers are based on pure/inbred dogs. Hybrid dogs are much healthier, so they cost much less in vet bills. I like to look at the value of a dog by comparing the costs to the benefits. For example the Chihuahua very high cost £88,691 on average, only contributes companionship to the family. A good working Mastiff however costs radically less and not only contributes companionship, but also protection with zero response time (no PD in the world can match that), and any other job you can give them. I even use mine as draft animals. However, if your unable or unwilling to pay for the care of a dog you shouldn’t get one. 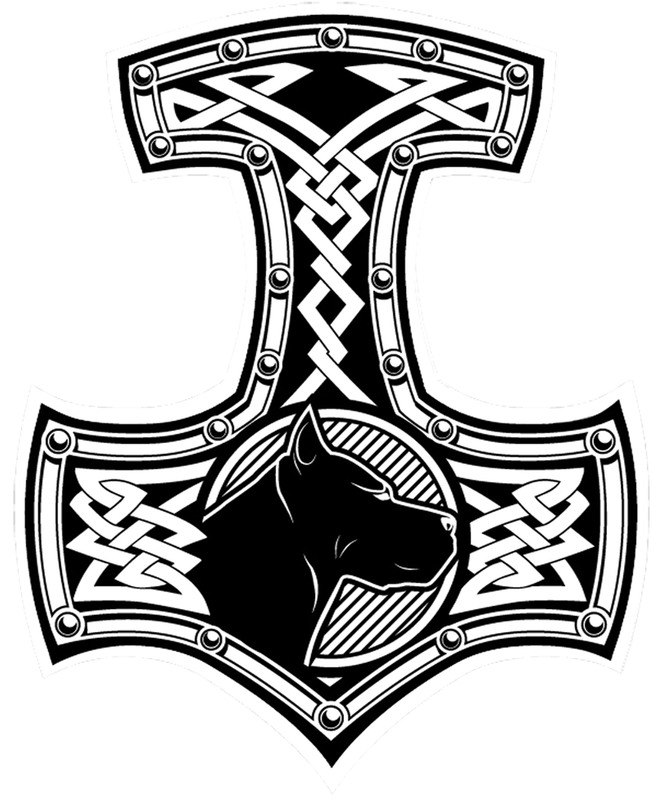 Should I get my Midgard trained in personal protection work? I personally think any dog intended to guard a family needs PP training. There are many people who feel a guard dog should protect on instinct alone. While that is the cheaper route, that’s like hiring a bodyguard with no training to protect on instinct. A dog must be bred for the work, but to do his best he needs training – real professional training. A fully trained PP dog will have many advantages over an untrained aggressive dog. The first is control. When the dog reacts to a noise at the door you will have commands that will tell the dog to react aggressively or to calm down and let them enter. The dog’s aggression will be something you can turn on or off. If the dog does have to bite someone you will have commands to release the person, hold the person, or bite them if they move. You’ll be able to pick the dog’s target on the body, arm, leg, groin, shoulder, etc. The dog will know how to target around a weapon so it doesn’t hurt its teeth and still gets control of the weapon. He will learn how to use every natural weapon he has to the best of his ability. Think of it as martial arts training for your dog. Will PP training make my dog mean? Real PP training should teach your dog to be watchful but calm and friendly until commanded otherwise. Too many people think to train a dog to protect you have to “make him mean”. This usually involves abusing a dog until it becomes a fear biter which just means he’s so terrified of everyone that he will bite anyone. That’s not PP training, that’s animal abuse. It will turn your guard dog into a dangerous liability for everyone, including your family. A well bred guard dog will bite to protect himself, his family, and his home, that’s not something you’ll have to make him do. PP training teaches when, where, and how to bite. Are they safe around kids? Like any dog with prey drive they will have to be trained not to chase cats and other prey animals if that’s not something you want. As far as other dogs I breed mine not to be dog aggressive, but they won’t back down from a fight so if the other dog likes to start fights they will step up, but are typically very social especially with other dogs in their pack. It’s not very useful to have a guard dog who has to work alone. A pack of guard dogs is much more powerful than a single individual. That said not every dog I produce is going to live up to this ideal, but there are usually signs from an early age that can help me place that dog in single dog homes. I really like my well trained Midgard. Where can I show him off? The venue of choice for showing off the greatness of your Midgard Mastiff will be a working trial, a pulling competition, or on the street. One of my favorite places is Petsmart, they always draw a crowd. Should a Midgard have cropped or natural ears? There is no standard, some people like cut ears some like natural. Personally I make my judgments on a dog by dog basis, on what I think will look and work best for each dog. When I do crop a dogs ears I like a working crop, it’s a longer crop with fuller sides. It gives the dog full control of its ears, it can point them forward, backward, or sideways and even fold them back and down. That crop gives a floppy eared dog as close to natural standing ears as it can get, and better directional sound collection, so better hearing. Kronos has working cropped ears. Again it’s a matter of preference on a big, long bodied dog the tail provides a useful counter balance, but it also stings like a whip on a dog this size, and can knock things over on a tall inside dog. Personally I like my dogs as agile as possible so I leave the tails. What are the Special Projects? That is a secret project we’re working on at the moment that will be unveiled to the public in mid-late 2016 if everything goes right. 2010 Morrigan should be in heat before the end of the month. what percentage of pit bull blood is in your dog /overall program? My name is tobi, i want to ask what percentage of the puppies in a good working line litter should be suitable for protection work. It depends on several things, some lines produce more consistently than others, and some dogs produce more consistently than others. Especially with bandogs and other “crossbred” dogs how well they produce varies with the individuals paired. The other major factor is how high your standard is, if all you want is an aggressive dog, you’ll find a lot dogs to fit that standard. If your looking for a dog that has lots of confidence, power, nerve, speed, prey drive, fight drive, defence drive, alertness, intelligence, jaw power, trainability, desire to please, size, endurance, health, child tolerance, scent ability, handler sensitivity, and energy, without being over the top, rank driven or unstable, then your going to find a lot fewer pups that meet your standard. In the end it depends as much on what your looking for as it does on the line and dogs being bred. Sir thanks for all the useful information……I see a GOOD dog book in your future, any incites on nutrition. Once again thank you for sharing your knowledge. Nutrition is like training, you get out what you put in. If you feed a dog garbage you’ll get a dog who feels like garbage. No dog will meet his full potential, if he feels bad from a poor diet. I would recommend not only an all raw diet, but an all game diet. Wild game is what all canines evolved eating. It’s what their bodies expect. Most of us don’t have the time or resources to hunt every meal our dogs get. For the rest of us the science behind dog food has come a long way and there are some great options now. My opinion is every dog is different and every dog food is different, some dogs are going to do better on some foods and some amounts of foods than others. You just have to use trial and error to figure out what your dog needs most. I always wean pups from milk to raw meat first it’s an easier step than milk to dog food. My pups this morning got deer meat and brim for breakfast. Rank based aggression can be a working drive, the main problem is rank aggression is a social form of aggression so it can easily be turned on the dogs own family. I don’t like rank drive, it’s hard to live with and it’s dangerous. A personal protection dog should reduce the danger your family faces not add another danger. I’ve used different blood from different places. Most of the dogs I have are from my own past breedings, but some are dogs I’ve bought, and I’ve also studded dogs from outside my program. I’m willing to bring in any blood that’s quality and has the traits I’m looking for in my program. Are your dogs pure or inbred? Neither, they are cross bred dogs, so they aren’t “pure” bred, and I don’t inbreed because of the genetic problems associated with inbreeding. It’s also important to note, that the “pure” breeding idea is only about 150 years old. Before that dogs were bred for what they can do. So a fox dog was any dog that would hunt a fox, a shepherd was any dog that would heard sheep, and a guard dog was any dog that would guard. All pure breeds were created by inbreeding and staying with that limited popluation. For example all boxers are descended from one dog named boxer. All boxers are the descendants of boxer and his children all bred to eachother. All “pure” breeds are created by only breeding closely related individuals, this is one of the major factors creating the health problems that plague modern “pure” bred dogs. From what o understood a bandog is, at least in the start or some point, a cross between pedigree or pure breed dogs. So do the health and genetic problems that the individuals may have pass on to the bandog? For example as far as i know Napolitano Mastiff is used in many cases. How do you know that it does not have an ancestor as the one in the horrible pictures you showed in your article about Distortions in “Working” Breeds? Genetic problems from the foundation breeds can pass on to the cross bred offspring. The most important thing to preventing genetic problems from damaging your line is be very selective about what you breed in. As for the example of the insane amount of skin on some neos. That is a trait that has to be maintained by inbreeding and selection. Outcrossing to a tight skinned dog like a Dane/Pit produces tight skinned dogs. Of course that’s also starting with a tighter skinned neo. Breeding two bandogs with neo blood could bring that back out, but it’s usually still a lot less than a pure neo. If that happens you just don’t breed that dog and select healthier specimens to father the next generation. Achilles is an example of a neo who can work . He may have looser dogs in his pedigree. The females I’ve selected for him are very tight skinned and athletic, if he does produce a loose dog or two I won’t use it unless it is extraordinary in every other way and far superior to all it’s littermates. In that case I might take that dog to a tighter dog and fix that in another generation. That’s the whole point of a selective breeding program. The results aren’t random, by controlling what genes make it to the next generation, you can control what the next generation is like. If you let loose, unathletic, driveless, cowardly, unhealthy dogs breed then that’s what you can expect from the next generation. You only breed the dogs that have those traits you want to see continue into the next generation. Occasionally you get a great dog who doesn’t produce great dogs. If that’s the case you stop using that dog and it’s pups then find one that will produce. Thanks, I look forward to it. As for the canis panther line, I don’t know much about them really, I’m not a big Dob fan but maybe they are an improvement. I’ve never met one. Excellent site and information. What originally fueled your desire to breed and create these great dogs? Is it hard to find quality Dane’s and Neo’s? You are doing an incredible service to these breeds in my eyes by keeping the working blood alive and available for people like me who don’t have the resources to begin breeding yet. A sincere thank you to you for this. It can be very hard to find a Dane or Neo who has a working temperament and a working body. That’s why it’s so important to capture it when the opportunity presents itself. I got into these dogs originally because of an attempted home invasion while I lived in Jackson, MS. Two men in ski masks with short barreled shot gun tried to break into my house. Luckily I have my own shot gun and they didn’t want a fight they wanted a victim. At that point my biggest concern was, what if I hadn’t been home. What if it had just been my wife, daughter and infant son at home. That’s when I decided I needed something other than me alone to be on guard to protect my family. It had to be powerful, tough, fast, attentive, capable, athletic, and family safe. That’s a tall order but I feel like a well bred Bandogs type mastiff is the best option. I have had my dog for about four months. He is two years old and since he is a rescue I do not have a medical history. I have been researching the breed and have not found much information on dietary needs for a pitbull mastiff cross. If he eats certain types of dog food on the cheaper side or with beef he gets bumps all over his body. He is also picky and doesn’t like any dog treats except fresh soft oatmeal treats from the cooler at petsmart. He will not eat the food our Vet recommended and sells at the office. I am at a loss and do not know what to do. I am willing to make my own good for him but I need to know know what this type of dogs dietary needs are. If you have any advise on brands of food or recipes I would be very greatfull. It sounds like he’s got a protein allergy. Autoimmune issues are usually the result of tight inbreeding. It’s getting more and more common with bandog breeders to try to return consistency with lots of inbreeding. It’s the easy and quick way, but the cost is dogs like yours. I’d try feeding a raw diet, but avoiding red meat in his case. Try his reaction to raw chicken or fish. If possible try whole raw animals like rabbits or squirrels, including organs, hide, bone, everything. Just be sure he’s wormed monthly if you do that. If not, he can live on a diet of chicken and rice, I’d add some fish oil or fish though. If he can tolerate it, even some plain yogurt mixed in. but I’d introduce one new food at a time and watch for a reaction. As for him being picky, that only lasts so long. keep the food available to him and nothing else he’ll eat when he’s ready. Don’t feel bad if he doesn’t eat for a few days, dogs can go weeks without eating, and it’s what’s best for him. Besides if he’s got food and he’s choosing not to eat it yet then you have nothing to feel bad about. Though I wouldn’t start with raw food if he’s that picky, siting out for a few days it’ll rot. Well seeing your passionate hard work is inspiring David i love how your dogs are agile, stable and strong, you´re quite different from other bandog programs. I have a doubt about your goals, are you developing 2 lines? cause the one from achilles may throw out bigger boned more muscular overall dogs and the one from kronos are more like the old fashion great danes isnt it? and my last question would be what do you think of working line giant schnauzers and working line dobermans. Thanks for your time and excuse my annoyance man haha but you know a lot about this stuff and its great to hear opinions from a professional. Just one line. Remember Kronos is half Neo himself, though he’s a generation removed. Physically both Kronos and Achilles are a bit too specialized for my program. Even though both are great dogs, Kronos is built too much like a coursing dog and Achilles is built too much like a brick wall. Achilles is more powerful but could never keep up with Kronos. In the end I’m looking for more of a balance in their shape more like Tyr or Freya. Balance produces versatility, and that’s what I want more than a specialist. It’ll take time, like all good things. Giant Schnauzers are nice in a lot of ways as working dogs but too rank aggressive for a family dog. I’ve never seen a doberman who really had what I’d call heart, I’ve seen plenty with drives but nothing like the heart and commitment you see in a good working bulldog or mastiff. G’day mate, just discovered your writings very recently & can’t stop reading, here in lies the problem, it’s killing my eyes! So I’m wondering if you’ve published any bandog books ? I can get a hold of? would like to learn more about PP & the raw diet, I feed Dexter (my 29 kg/64 pound 5 month old Australian bandog) raw eggs,cooked pasta,good quality canned dog food, puppy milk & fish oil tablets at night & usually bones/chicken necks & kibble in the morning. Wondering if I should swap canned food for roo meat as Roos are pretty much the only game meat that’s easy to buy here. Thanks, I’m glad you like my site, there is more to come. No books I’m afraid, you’re not the first person to suggest I write one, maybe someday I will. I would stay away from canned food all together, it’s more water than food and sticks in their teeth causing tooth decay and mouth problems. I’d stick to game meat and bones as much as possible including hide, tendon, cartilage, organs, especially the liver. Ideally feed whole animals, but I stay away from fillers like rice or pasta. Fish oil is good, whole fish are better. With a diet like that the puppy milk isn’t needed at 5 months old. Working mastiffs tend to do best with animal fat as their main source of calories rather than carbohydrates. I feed a pretty high protien diet of meat, from as soon as they grow teeth. It also makes weaning easier if you go straight from milk to meat. The information about feeding low protien to mastiffs during early development is based on an outdated and disproven study that was poorly done. The dog food companies have clung to that idea because low protien dog food is cheaper to make and has a larger profit margin. Hello. Love your program and the writings really make sense. Love Mississippi too! Used to live in Long Beach. Do you have any pups now that test high for personal protection? I live alone in a drug infested town in Arizona and I believe in your ideas and program. Also, do you ever have a problem with bloat? Thanks Sean, I don’t have any pups at the moment, my next breeding will be this July. I’m sorry your town is in such bad shape. I use to live in Jackson MS, parts of it are very bad. After an attempted home invasion I got my first working mastiffs and eventually moved back to the country. It sounds like you do need a good dog. I’ve never had a problem with bloat I credit that to my dogs having a more balanced natural build, raw feeding, and they drink through drinker valves for dogs. Other than that I’ve never taken any special actions to prevent bloat and haven’t had any issues, or heard of it happening to any dog anyone’s ever gotten from me. The basic dimensions I’m looking at are something like 32 inches at the whithers, 165 lbs, chest about 12 inches wide, torso about 40 inches long. I’m a big believer in large amounts of lean muscle. A protection dog needs, muscular front shoulders for pulling back and manipulating while engaged, they need a very muscular jaw, neck, abdomen and back for controling what they have bitten, and they need a very muscular hindquarter. The hindquarter is really the root of a dogs power in combat with a man. Too many big dog breeders over emphasize the shoulders and the head, at the cost of the hindquarter, neck, abdomen and back. That doesn’t work very well, it’s kind of like getting grabbed my a man who has strong hands but a weak chest and arms, he can hold on but that’s about it. Without a strong foundation you can’t control your opponent. I had a couple questions and would like to state great answers on the previous question. You can tell your direction for the breed is correct and for the betterment of the breed. I applaud you for that. Its obvious this breed isn’t for everyone and proper socialization and obedience training is mandatory as a pup. My questions are rather simple. Do they drool and shed? I haven’t seen anything about either topic on any sites about the Bandog. What’s the life expectancy? Thanks for your time. Hope to hear from you soon. There is variation on that, some will shed some and have a short seasonal coat, and some are very clean, don’t shed and have no seasonal coat. Some drool usually less than a mastiff but it’s still there, and a lot of them don’t drool at all you just have to look at the individual dog. The life expectancy is usually 10 – 14 or so but depends a lot on how much mastiff blood they have. I have a litter now between Achilles and Shakti. I’m planning on a breeding for him later this year with one of the daughters of Achilles and Freya. He is a very excellent dog, I’ve been waiting for Achilles daughters to grow up to breed him again. Sir, I will look no more I was in the market for a dog that would do well in PP and just be well rounded in all aspects of training and I thought I was sold on the Presa Canary until I was informed to check out your site first and I am happy that I took the advice. Do you plan on breeding Tyr or Kronos near the latter part of this year and if so do you have a pick of the litter price? Once pregnacy is confirmed how soon will it be before you accept a down deposit? Thanks, I’m glad you like my dogs, I’ve put a lot into them. I currently have a litter out of Thanatos who is a Kronos son and Kita which is Tyr’s mother. Because Thanatos’ mother is Tyr’s father’s sister this breeding will basically be 75% identical to the litter that produced Tyr, but 25% of the genes in that litter will be from Kronos. I only take the first 5 deposits once I know the pregnancy is confirmed, after those five the rest have to wait until the pups are born so I know how many their are. The prices aren’t set by pick order the prices are based on testing the pups temperaments and drives, picks are done first come first serve. I may not have first picks available because I only breed when I want something for the program. I don’t always keep a male and female, but I always keep something. You can see a better description of pricing and testing ranking of the “For Sale (pricing and discounts)” page. I would like to thank you once again for all your replies, you are running a great program and it is even greater that you keep things open like that. Keep up the good work! I selected individuals who had the traits I needed almost regardless of breed. I believe in the old dogman saying “a great dog is where you find it” which means a great dog can come from anywhere or in my case any breed or line. There are some facts about certain breeds to keep in mind though when making breeding choices. For example, if I found an awesome working English bulldog who wasn’t that badly built and worked as a catch dog and a protection dog with an extraordinary mind, I would still most likely avoid using him because according to OFFA statistics 72% of English bulldogs have hip displasia, and considering HD is a polygenic recessive trait, that means if the vast majority of English Bulldogs are affected by HD then all or almost all of them carry at least some of the genes for HD. That is a really shameful and telling statistic too, especially considering the instance of HD in Great Danes is only 12%. It’s strange that people think of HD as a “big dog” problem when Danes which have a low instince of HD can be over 200 lbs, and the top breed for HD is the 50 lb English Bulldog followed by a close second the 15 lb pug with 67% of the breed suffering from it. Eventually people will learn that genetic decease comes from breeding unhealthy dogs not from size. Wow. I am just surprise since I have been looking for a dog with the charasteristic of your program for a while. I would like to buy a male puppy with pp temp for my family. As I can see, there’s only females pups available. Idont care for looks but for everything else that you mention from your dogs. The closest I found to what I like is the CAS or CO but are way to “independent” (based on my readings) and certainly not good for Petsmart trips. I have a 4 year old son and I honestly think that a family without a dog is not a complete family. When are you planning for another breeding so I can send a deposit for a male? Thanks. It seems like we’re definitely like minded about dogs. The next litter has been bred and I’ll announce it once she starts showing. David I share the same view of the powerful working mastiffs of old, respect and admire the mission you´re at dont give up man. I really expect to someday own a pup from you very similar to Tyr in build. Also one question, have you visited cerberati.com or even contacted the guy who breeds there? Check it out and please comment what you feel about it, both of you are the ones who jump into my mind when dog people ask me if someone is doing something big for the terrible state of the mastiffs overall. Thank you, I’m glad you like my program, we’ve put a lot into it am we’ve been lucky enough to have a lot of success in producing real working mastiffs. As for the website you mentioned, it’s hard to tell what they have. I appreciate the effort or money they put into the high production value videos and website, but with the cuts, color filters, and slow motion it’s hard to see much about the dogs. They do look more fit than a lot of mastiffs, but without working videos, and less edited footage and photos it’s hard to form much of an opinion of what they actually have. Its interesting you mention cerberati here. Davis my brother-inlaws boss recently received a dog from those cerberati guys. Rex 4 months old a tough one with mad drive on tug and looks the spitting image of a rino. We been talking with a few about them and general consensus is that no one can get close enough to the kennel to find out more about them. A few say they have 90 odd dogs mastiff and sheperd breeds. If thats true then the scale of work they must be doing needs to be discussed, I havent heard of anyone anywhere working with that much stock. I like their hollywood style videos but yes we need to see some working videos. Based on Rex the mind goes nuts to imagine the videos they could put together of the maturer dogs they have. Why is it that all of you breeders who have breeding programs never talk about the work you do indepth? Wish I had the money and time to have a program like you all. We bred a few bandog ourselves with our pa years ago but since moving out the ranch we stopped. And now hearing about you and reading your website your goals and seeing Rex the cerberati puppy and reading their website its got us motivated again. I must say, I love strong breeds like Mastiffs, Rotties and especially the APBT. I am very in love with your idea and what you’re aiming for. Your goal is much my own! Capable, nurturing, protective and versatile working dog that is not only strong and fearless but sound and healthy. Now. I had a littler of Neapolitan/English Mastiff pups. Nine together. From this litter there was high potential. I bred for soundness and health, endurance and drive. Strength, intelligence and a protective ability, along with a nurturing, loving and loyal family dog aspect. From this litter there have been protection dogs, therapy dogs, service and guard dogs. One; a fawn female, I had kept a little longer to teach her light pull work, guard work and control. She’s well mannered and very loving. Do you occasionally get the purebred activists babble about pricing or the fact that your amazing dogs are not purebreds and are “insults to the mastiff breed”? Has anyone ever tried to “educate” and inform you that you should never teach a mastiff protection work because they are already natural guard dogs(Haha)? Basically those who figuratively spit on your lines? If so, how have you dealt with these instances? Also, I feed all my dogs raw. Do you feed exclusively a raw/ prey model diet? Do you vaccinate? If so what, and how frequently? Lastly, how did you begin your program? I use to get those sentiments all the time from “purebred” people, just keep doing what you want to do and ignore them, they go away. They all seem to forget that their breed of choice didn’t always exist, and they where mutts once too, back when they were healthy and useful. I get the whole mastiffs don’t have to be trained to protect thing all the time and I actually agree with that, but they do have to be trained to do it on command, stop it on command and all breeders have to be proven to have the commitment to really work and not just bark. I feed mostly raw, with some kibble as filler. I do vaccinate at 6, 9, and 12 weeks, I don’t usually mess with boosters etc. I started my program because I stopped an attempted home invasion, two men in ski masks with “sawed off” shotguns tried to break into my house. I stopped them with my own shotgun, but if I’d been out it would have been just my wife and kids at home. I knew I needed a dog who I could trust to protect my family and that I could trust with my family. The working mastiff has the perfect temperament for that, but their body holds them back. My program is about giving them back the tools they need to do the job the way their forefathers did. Do any of your breeding dogs have health problems that adversely affect athleticism (hip dysplasia, elbow displasia, etc)? My program is centered on working dogs, major genetic defects like that which prevent the dog from working are not tolerated. I wouldn’t breed a dog with one of those defects. I completely agree. If there is no control of your guard and protect driven dog, an innocent could get severely injured, and you in lots of trouble! Haha. I’ve gotten a few people who tried to tell me that if you teach PP work, the dog becomes aggressive, that’s why you don’t and shouldn’t do it. Of course the majority are show dog owners. That’s a really scary situation! What dogs did you choose to begin with? And how did you determine that? Hello sir. Happy new year to you and yours. I’m not sure if you are going to receive this or respond to it but here goes. 1st off I want to thank you for all of your information and pride you take in your work. I hate to sound cheesy but it really gives my wife and I a warm and fuzzy feeling knowing that at least one breeder feels the exact same way we do when it comes to common sense and morality so to speak. 2nd we WERE thinking of getting an Boerboel, but we really feel that after viewing your site, we need to loo no further. my only question would be this……most or all of your dogs have a high pack drive, but they do not have to fill the alpha roll correct?? is this saying that they normally aren’t dominant to their handlers/owners?? thanks so much. thanks for your response. I’m kind of new to the bandog arena, but I know that I like your thinking and common sense, and although I hate your family was home invaded, I can relate to the reason why you started breeding. do you ever for example only use a neo mastiff terrier mix? if so why? and if not why? I’m only asking because im new and want all the info I can before making a lifelong choice. also when you use the pit bull in your breeding program are you ever worried that they will have the high pack rank? thank for your time and patience sir. I’ve never used a Neo/pitbull cross directly because the ones I’ve seen tend to be too short and stocky to do much work for very long especially the big game hunting aspect of their job. The closest to that cross I’ve gotten in Dane/Pit x Neo, that helps balance the small size of the pitbull and the stockiness of the Neo to create a much larger and more athletic and capable dog. I’m not worried about bringing high rank in through the pitbull because even though they aren’t as naturally submissive as a mastiff, they also aren’t like a hearder, rotti, or Kangal. Most game bred pitbulls bring a lot of fight drive and prey drive not a lot of rank drive because historically rank driven dogs didn’t win in pit fights and were called rank curs, as a result they aren’t typically highly rank driven dogs. Even so in my program the pitbull blood is a very low percentage. Since my goal is to create a working Mastiff, the main genes I want from the Pitbull are their athleticism, high metabolism, grip, and prey drive, so I don’t need a lot of pitbull blood to achieve that. typically Bandogs don’t breed true in the sense that they are all the same, but there are two approaches to do that. The first is the same way nature makes things breed true which is to have consistent selection for enough generations that variations in the traits that are selected on are reduced by pure selection, the second method is tight breeding that reduces all genetic variation. The second method is faster and easier but more dangerous to the health of the animals. That said I do use a certain amount of line breeding, but I also outcross heavily. I use a bit of both methods, mostly I use deep generations of selection, to create limited consistency but at this point in my program I don’t want a lot of consistency because I’m still working to develop my end result mastiff. At this point I need a bit of variation to allow me to create changes, once I produce exactly what I want I’ll likely step up the line breeding to create more consistency on that end goal. Ur Dane&pit x neo cross do use the Dane&pit for males to make ur pups leaner an taller with more legs an the neo females for guardian instincts? Im a big admirer of your program who would like to better undertstand your vision, hope you dont mind answering these questions. Would you keep increasing your line size(height,mass,power) or anatomically enhancing beyond your actual goals only if biomechanics allow it and performance stays in peak form? Will you keep perfecting functional behavioral traits? Would you actively search for natural mutations in your line that allow it to evolve at some level? i would like to ask if dogs with this kind of height/weight are suitable for hiking/trecking in rough terrain. i mean in a way it’s not harmful for their bone structure (hips for example). thank you. Yes they do fine, I take the for long hikes in the woods and we’ve hunted for 16 hour stretches without any issues. Wow, great specimens, I am going to be in the market for a dog pretty soon. Your dog’s are so agile. Do they make good pets when not in working mode. For a person that has grandchildren that visit would you recommend a male or female, or does it make a difference? They do make good pets, they are usually laid back and easy going as adults just watchful and ready. They are very close to the people they know and love. It doesn’t make much difference in that sense if it’s a male or a female other than males tend to bond closer to female humans and females tend to bond closer to male humans. Thanks, I see you use some american bulldog blood. I have always owned american bulldogs. Hog hunting dogs from performance lines. I live in south Florida and lately most breeders down here are breeding more for show rather than function. I will be trying to get a dog that can be put on the ground and catch hogs not other dogs. I am leaning towards a female. Hey, I’m a freshman college student who has been looking for heavy duty dogs like yours, for when I get out of college.I’ve looked at mastiff like the cane corso, Presa canario, do go argentino, boerboel, rottweilers. I like each dog, but have been searching for a good combination of those dogs. But it’s hard to predict the temper me to oday a mutt. That’s when I came across the Serbian Defense Dog (SDD) a breed that seems heavy duty and based on various forums the the best mix of family friendliness, but a high defense drive, yet can stay calm until clear signs of a greasing are shown…. that is until I came across you. Your dogs seem very similar to the SDD, but the difference is, as far as I can tell, you have yet to introduce the wolf line. I will be finishing college in 3 years and I was wondering if the introduction of the wolf line is going to happen withing that time frame? P.s. even if it isn’t, I very well still plan to get a dog from you guys. I’m hearing great things. And nice Norse names for your dogs. Works well with the name of your website. I doubt I’ll have the wolf cross done by then, if I do it’ll likely be the first generation crosses and I’ll be very selective about where those pups go for safety reasons. After a couple of generations of blending them back into my dog line they should be as dependable as my dogs are now. Good evening David just an admirer of your work passing by, haven´t seen any updates recently so I hope you, the fam and the program are going well. I’ve found a much better way, to address those issues. Once I’m done I should be able to take a lot more direct control of what genes they get and from where. That’s incredible to hear, your dedication will be seen through these noble yet fierce athletic mastiffs of yours, can´t wait to see the next stage. Are you able to ship one of your dogs overseas, I’ve been looking at your dogs for a while and i would really like one. I can but it’s very expensive.